Our favorite Disney food this Friday comes from a place we ate at for the first time last year, Via Napoli. This restaurant instantly became one of our family’s must dos and the reason is all because of the pizza. When we ate there, we chose the Margherita. It was absolutely perfect! Pizzas at Via Napoli are cooked in wood-burning ovens named after the 3 active Italian volcanoes. This helps the pizza get a crisp crust. To add to the crust, the pizza is topped with fresh tomato sauce, fresh mozzarella and lots of basil. Upon first bite, you can taste the tart sauce,the creamy cheese and the sweet yet spicy basil all working together to create a beautiful taste experience. It reminds me a lot of the pizza I ate while studying in Italy. We leave for WDW tomorrow, but honestly, I can’t wait for our ADR at Via Napoli on Monday! You can be sure that we will be ordering the Margherita pizza! Oh that looks so good, we haven't tried their pizza yet. Have a great time on your trip, we head down on Thursday night, but just a quick trip staying through the weekend. Thanks for joining the hop this week! Thanks for having us! You must try VN sometime, it's so delicious! Have a great trip! Oh we love Via Napoli! Everything I've ever had there is so good especially the pizza! Have a wonderful trip! Thank you! We'll save some pizza for you! lol! That looks and sounds amazing! 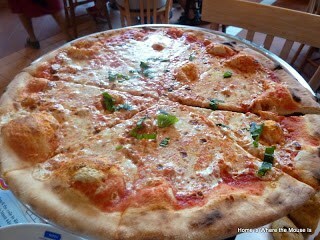 I haven't tried Via Napoli yet, but I'm pretty sure my next trip will involve dining there! You should definitely try it and let us know how it goes. The pizza is a must have so are the risotto balls! Oh my Lisa, I can see why you are looking forward to that ADR! I like a basic pizza and this would suit me just fine. Bon appetite!